In 2017, the total value of goods imported into the Cayman Islands increased by 2.7% to reach CI$876.0 million, compared to $852.6 million recorded in 2016. The growth in the value of imports was largely driven by higher petroleum imports, which went up in value by 17.0% to total $109.0 million. This resulted from the growth in the average price of oil in the international market, as well as the quantity of imported petroleum products. The total value of imported non-petroleum products rose by $7.5 million or by 1.0% and was recorded at CI$767.0 million. Imports of miscellaneous manufactured articles such as furniture and parts, wearing apparel, professional and scientific instruments and photographic equipment supplies increased by $11.7 million or 10.1%. Imports of manufactured goods classified chiefly by materials such as parts of iron, steel and aluminium, other metal products, paper and articles of paper and rubber, increased by $8.5 million or 9.0%. 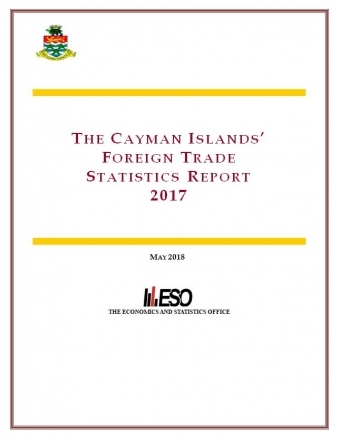 “The Cayman Islands’ Foreign Trade Statistics Report 2017"